I am standing at the altar the night before my wedding day. This is the practice run, when we all go through the motions, like actors rehearsing a dramatic play. Participants have been cast in their roles and are being moved from point to point by the wedding coordinator. My dad has stopped at the bottom of the stairs to the raised patio, where my fiancé Eric and I will say our vows. He seems out of place, like he’s misread his stage directions and isn’t sure where to go next. Everyone around dad is chatty, and smiley, and informal. Everyone except him, that is. I am growing tense, waiting to see if my father is coming up the stairs or going to his assigned seat in the front row. Caving in to pressure from family, I’d invited him to walk me down the aisle, despite a mountain of reservations. And I was already regretting the decision. He had been scowling since the moment he arrived. There’s an exchange of words between my soon-to-be-husband and my out-of- place father. Eric extends his hand in a friendly greeting, knowing of dad’s disapproval, of his disdain for Eric’s liberal, Jewish background. That’s when I see it, dad’s two hands hooked firmly into his pockets, like a mannequin stuck on display, waiting to be carried off set, while Eric’s hand falls to his side in peaceful retreat. This was the straw that broke the camel’s back, as they say. As I sit cross-legged on the comforter that doesn’t match the sandy paint color in my bedroom, I contemplate calling dad for the first time since my wedding day, nine years ago. The thought of picking up the phone after so long makes my throat feel dry and cracked, like I have been walking in a desert, trying to prove some sort of patriarchal faith I just don’t have. My dad is almost eighty now and lives in a nursing home, apart from his third wife and third family. He barrelled through his first two marriages like a reckless animal, breaking down each house he had carefully built, trampling vows, and tearing bonds between children and stepchildren. I suppose, if he had enough time, he’d do the same again. But I don’t hold any of this against him exactly. Sometimes, people just can’t stop their cycles of personal destruction. What I can’t dismiss as easily, however, is the extensive internal damage done to me (and others), from a history of never knowing which flap of the cape would trigger his anger or which gently poking stick would send him charging through the arena. I was the involuntary matador to his raging bull. “Elizabeth!,” I could hear dad screaming. “Yes, sir,” I replied, on high alert, stomach knotting. “Did you leave the board game on the stairs?” he asked, as puffs of smoke left his nostrils. “No, dad,” I said, shaking my head emphatically, crossing fingers he’d believe me this time. “You left this on the stairs!” dad yelled, huffing and puffing, angling his horns toward my internal organs. His hooves had already left the ground; dust was billowing into the air. It didn’t matter, you see. 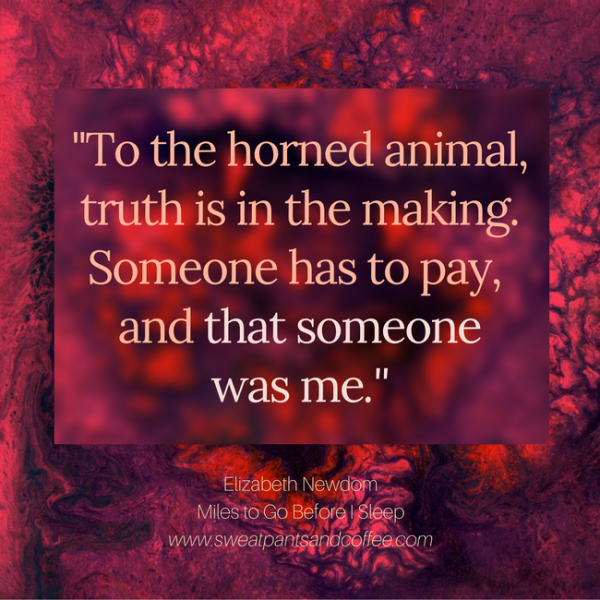 To a horned animal, truth is in the making. Someone had to pay, and that someone was me. Then, there was the time dad walked through the closed screen door to the patio on a summer evening. Walked right on through, screen collapsing in around him, like a domestic villain entangled in a carefully placed web. I watched the whole thing happen, knowing full well he’d come straight for me, raising his hand in mid-step, poised to strike my rear. There were other incidences, too, always raining down like fire and brimstone: scoldings for skinned knees, misused vocabulary words, or talking out of turn at the dinner table. And then, there were threats not to cause trouble with wives number two and three, and promises, that if forced to choose between them or me, he’d gladly hand me the short stick. At a young age, my inferior place as daughter was clear. The Polaroid is almost 40 years old now, but the image has remained with me, a bookmark to the “before” period in my life. Before my father’s destructive reign over our household took its toll. Before the accumulation of gashes and scars. Before I would fade into the background of my own life, becoming a ghostly figure in future family photographs. As I linger on the shape of my five-year-old eyes, two perfect crescents, I am startled back to present day by the buzzing of my iPhone. It’s a pop-up of the latest news article from The Post, reporting Trump’s daily transgression, an executive order making it easier for corporations to bury sexual harassment claims, so they never see the light of day in court. This news sets off a chain reaction of moments when I’ve been silenced or not taken seriously. Moments I have been put in my place by one form of patriarchy or another. 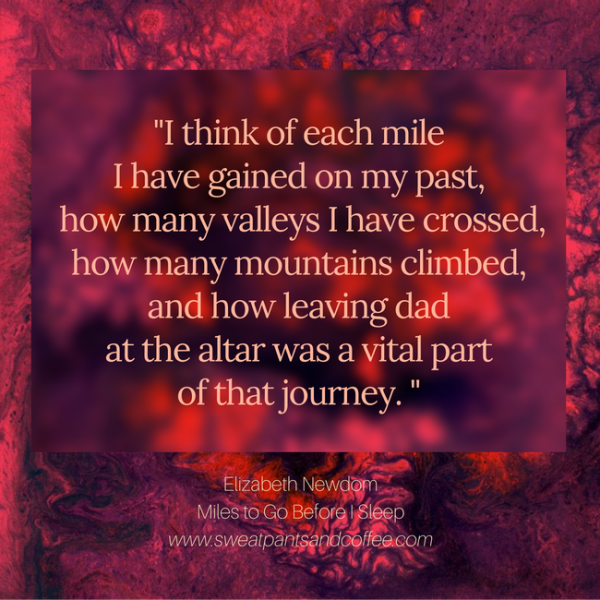 I think of each mile I have gained on my past, how many valleys I have crossed, how many mountains climbed, and how leaving dad at the altar was a vital part of that journey. My mother is visiting from upstate Virginia, just an hour and a half away. We sit drinking red wine in the evening after my son is in bed. After a glass or two, Mom’s cheeks grow rosy, boosting her courage to ask about dad. Am I going to visit him in the nursing home, she asks? Elizabeth Newdom teaches writing and literature courses at a community college in Frederick, MD. Her essays have appeared on Blunt Moms and are upcoming on Mutha magazine. Elizabeth’s personal blog, The Astronaut Wife, details her life as a mother, wife, and teacher and of rocketing away from her Southern conservative background: https://elizabethnewdom.wordpress.com/. How wonderful that you can write about your father and know that you put him in the past (at least as much as you can). I know it is not easy,and I’m spoiled, my parents were terrific. I cannot imagine what having a man, uncaring,and so self-absorbed as to never pass a word telling anyone else,especially you, how good and wonderful they are. But we know, always.